Hi, hello, hey there, bonjour, hola! by creating custom branded design experiences & paper goodies for weddings, parties & events! Thanks for popping by! We can't wait to meet you - introduce yourself! Does opening your actual mailbox to find perfect paper goodies announcing upcoming celebrations make your heart flutter with excitement? We SO get that! To hold this little beauty in your hands & enjoy its delicate & thoughtful design - we think that's kinda the best! We embrace the power of tangible design experiences & visual storytelling & we can't wait delight you & your guests! We are visual storytellers. We get to know you, learn your story & bring it to life visually through a unique design experience which results in a beautiful, custom brand we weave throughout your wedding, event or party's paper & other tangible goodies! Check out some of the custom suites we've made! Our wedding suites are 100% custom designed & beautifully branded so that they perfectly tell your love story! Hooray! We truly enjoy getting to know each couple we work with & our process helps us build our relationship with you & get to the heart of your love story! We are trained in visual communication & use those skills to help integrate the little & big details that make your love unique to create a visual story, design experience & brand to celebrate your love! Sounds fun right? Learn more on our custom process page! so we can make the perfect goodies to celebrate you! save the dates, invitations, enclosures & packaging, response, detail, hotel, travel & map cards, programs, backdrops, signage, seating charts, day of goodies, guest gifts, thank you notes, special stationery, stamps, ribbons…& so much more! paper, wood, leather, fabric, metal, concrete, glass, acrylic & pretty much anything else we dream up together! Our clients are the SWEETEST! See what they have to say about us! 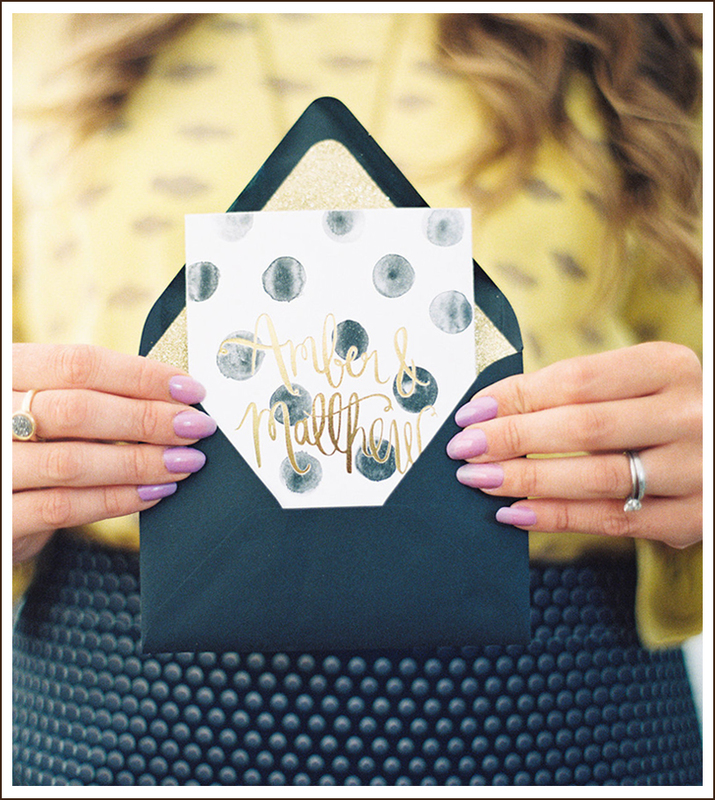 "...For me, the invitation was one of the most important elements of our wedding. I knew that this would be the first impression that our guests would have of our wedding & she truly exceeded our expectations in every single way, from the entire design process to the finished products. The response to our invitations was incredible. Almost every single person that received our invite reached out to me by text, email or call to say how much they loved them..."
"...I don’t think it would be fair to say that Caroline goes out of her way to make her clients feel extra special - I think that she just naturally CARES about people & her client’s happiness brings her true joy & THAT is what makes every handcrafted piece so amazing. Caroline’s style is so unique & her artistic abilities completely exceeded my expectations. Caroline is a true gem & I can’t wait for another wonderful reason to work with her again!" "There aren’t enough compliments in the world I could give to Caroline & her Lovely Paper Things! The only thing better than her wonderful designs is her sweet personality. Caroline was a delight to work with & did an amazing job in helping us realize our vision for all of our wedding paper goods! She is a true artist & her Lovely Paper Things were a perfect fit for us as a couple & our wedding style & theme! I can’t wait until the time comes when we need more Lovely Paper Things!" We're honored to have some of our favorite projects featured in top print & web publications! Looking for some lovely eye candy? Follow us @lovelypaperthings on Instagram!